When you're in the spotlight as much as Olympic athletes are, it pays to keep your personal opinions — and tasteless sense of humor — to yourself. 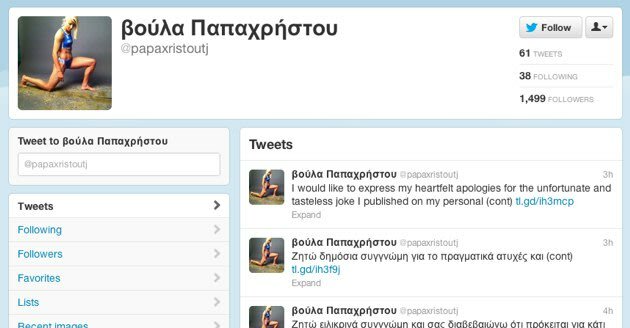 Voula Papachristou, a Greek track star, learned that the hard way after she posted a racist tweet to her Twitter account which promptly got her banned from the games. The tweet — which has since been deleted — was written in Greek, but roughly translates to: "With so many Africans in Greece... At least the West Nile mosquitoes will be eating home-made food!" "I would like to express my heartfelt apologies for the unfortunate and tasteless joke I published on my personal Twitter account. I am very sorry and ashamed for the negative responses I triggered, since I never wanted to offend anyone, or to encroach human rights. My dream is connected to the Olympic Games and I could not possibly participate if I did not respect their values. Therefore, I could never believe in discrimination between human beings and races. I would like to apologize to all my friends and fellow athletes, who I may have insulted or shamed, the National Team, as well as the people and companies who support my athletic career. Finally, I would like to apologize to my coach and my family."